Conor Dougherty in Wall Street Journal's article "New Library Technologies Dispense With Librarians" writes about the use of vending machines which dispense library materials. 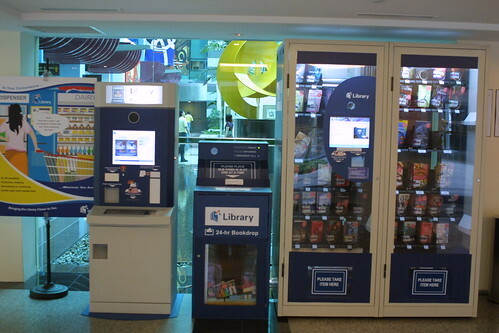 Instead of focusing on positioning these machines as librarian/library replacements, we should view these as user-centric models for the delivery of physical materials, at any time, in locations that may be more convenient to the library's patrons. Librarians already provide services through non-human interaction (e.g. reader services online), and, at least in my community, reserves are a non-human transaction (from selection to pickup). Furthermore, library vending machines in non-traditional places like grocery stores are an exiting way to increase the library's service & marketing footprint.